My dear friend and tech angel, Mary, was responding to my comment: “We need to make these immediately”! The comment was in reaction to a video she’d posted of Manuela (our new Pastry Goddess) making roses out of apples and puff pastry. I’m sure you saw it. I was serious about making the pastries. I was not, however, serious about making them right that minute because I needed to get over to the office to see a client. Instead, I was sitting on the couch talking on the phone and making comments on Facebook. I explained about being late for work. Mary had an idea. You may remember that Mary’s husband, Martin, has been battling leukemia. And, after 50 days of infusions, his final arsenic trioxide treatment was happening. Mary wanted to celebrate the occasion by bringing apple roses to the wonderful nurses at the local infusion center, Goshen Medical Associates. A few days later, Mary and Barbara (her amazing 17 year old daughter) came over and we got right to work. We had the most fun ever making both roses and rose buds! Mary said the nurses at the Center were delighted with them. Martin loved them, too. So, I made a few modifications (of course): I used homemade pastry. You may do the same or use store bought. If you want to make it at home, I recommend a rough-puff version. I don’t think it’s necessary to go for a classic puff here. I’ve done it and it’s fun, but for this project, the rough version is fine. Here’s a good recipe. This one is even simpler. Feel free to make a vegan version. According to The Kitchn, Pepperidge Farm Puff Pastry is vegan! I am not a huge fan of spice with apples, so I didn’t use cinnamon in mine. Mary and Barbara like it, so they used it. Your choice. And I didn’t think the powdered sugar added to the appearance of Manuela’s beautiful roses (and I don’t care for the taste of it), so I went with sparkly turbinado instead. I sprinkled it before baking rather than after. Again, your choice. If you make our own pastry, you can do it up to a week ahead and keep in the fridge. 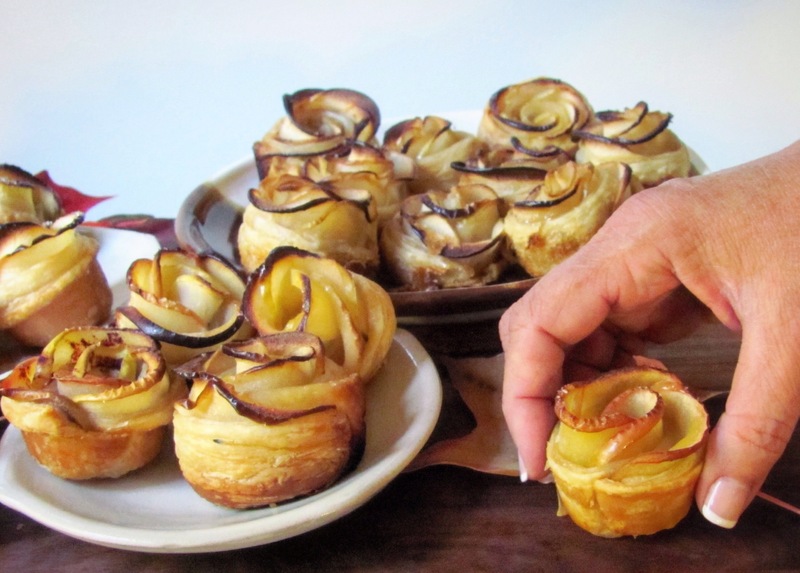 Puff pastry also freezes beautifully, so you can make up a batch and keep it handy for rose emergencies. 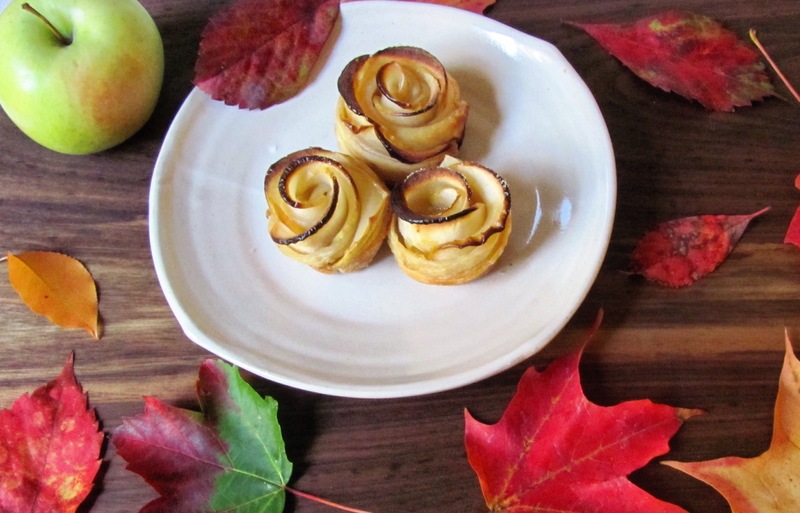 You can make just a few roses and freeze the rest of the pastry for another time! 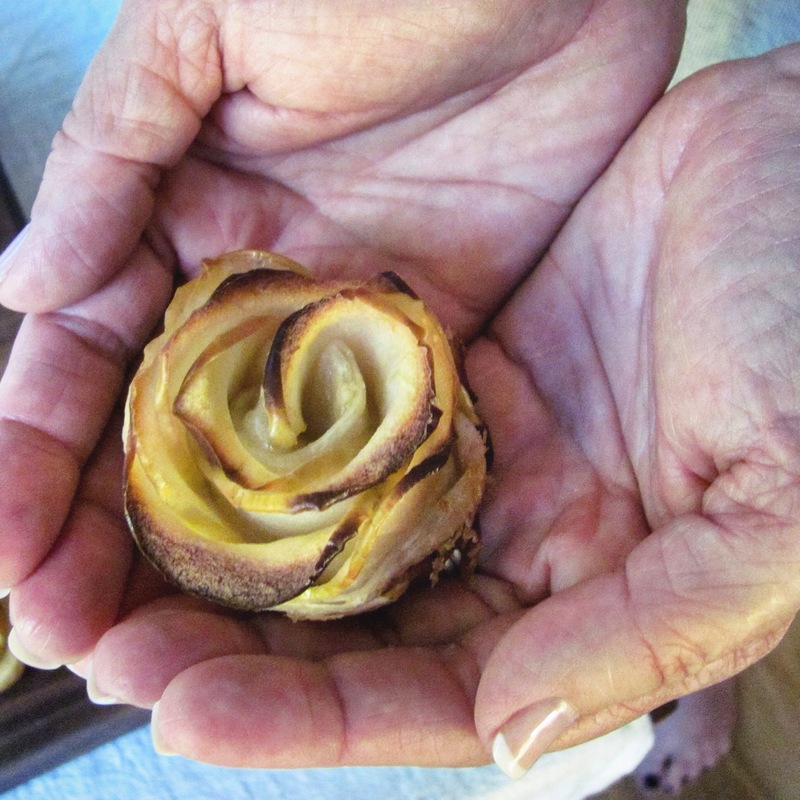 We made a dozen roses and 10 or so buds with our pastry. *You want an apple that will hold its shape. 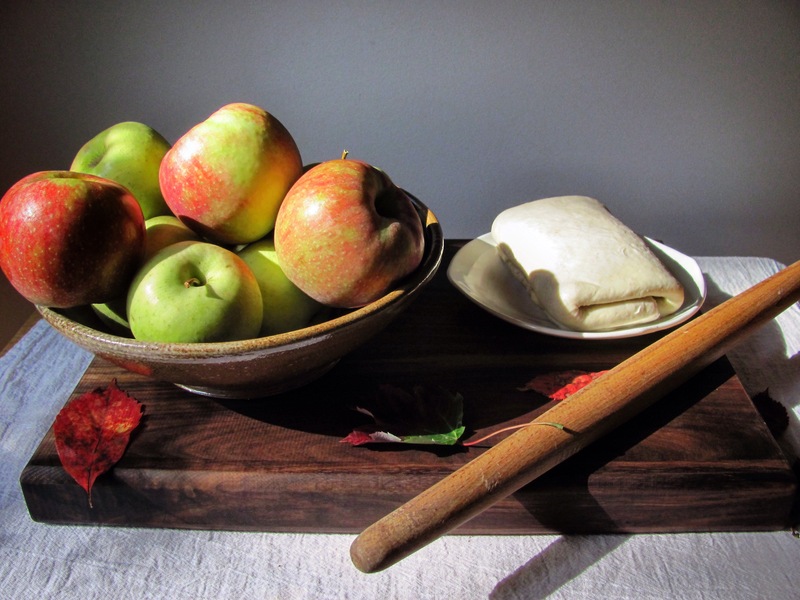 We went apple picking recently and the golden delicious were our favorites this year, so we used them. Jonagold or honeycrisp would be good, too. Use full size muffin tins for roses, mini muffin tins for buds. Prepare the pans by spraying them with baking spray. Heat the jam slightly and then strain. Mix with a little water to make a paintable, but thick syrup. Mix the lemon juice into ½ cup water. Working with one apple at a time, place the slices in a shallow bowl and moisten with the lemon water. Microwave on high for 45 seconds to a minute, or until the apple slices just begin to soften. Place them in a single layer on a dish towel to dry and cool. Working with 1/3 of the pastry at a time, roll out the dough until it is stretchy and thin, about as thin as you would want for a pie. I’d say 1/8 of an inch. Using a pizza cutter, cut strips about 2 inches wide and 6 inches long for roses. Go with 2 inches wide and 4 inches long for buds. 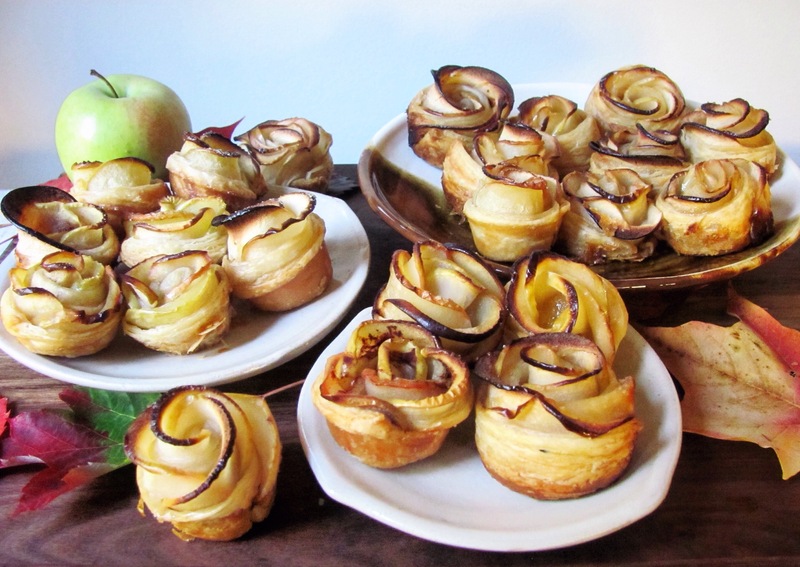 To construct a rose or bud, place a row of overlapping apple slices along the top half of the dough strip, with the peeled tops lying above the upper edge of the pastry. Paint the slices with the apricot syrup and/or sprinkle them with sugar. 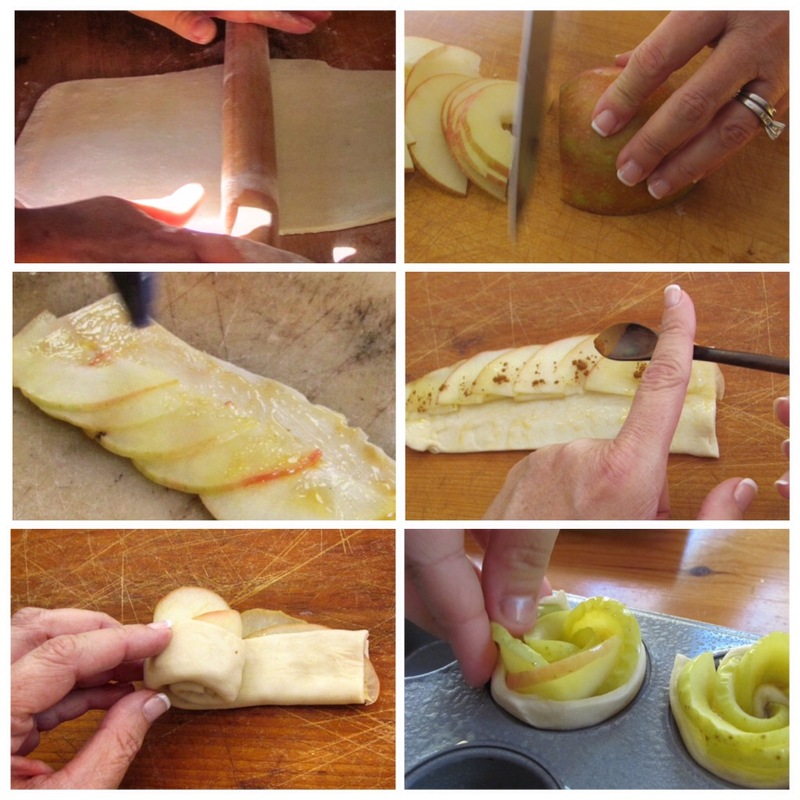 Fold the bottom half of the pastry up over the bottom of the apple slices. 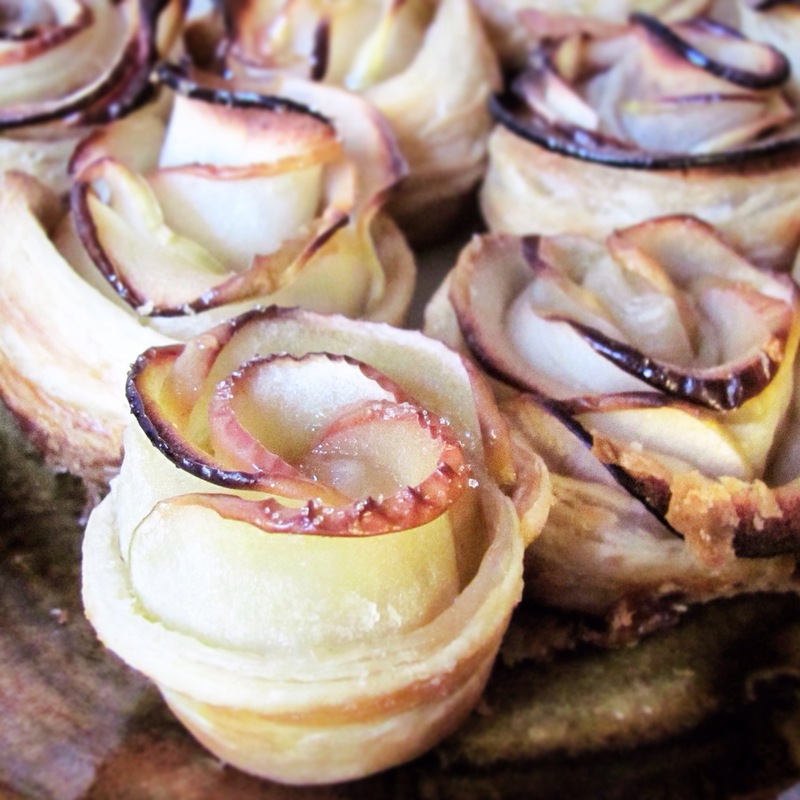 Now, roll up the strip and place the rose or bud in a muffin cup. 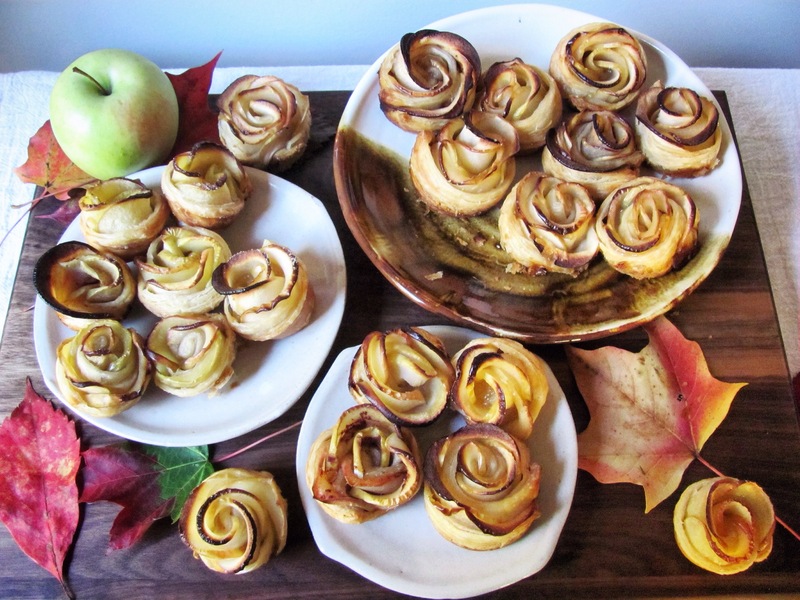 Once you have made as many as you can with that batch of apples and dough, place the unbaked pastries in the freezer. 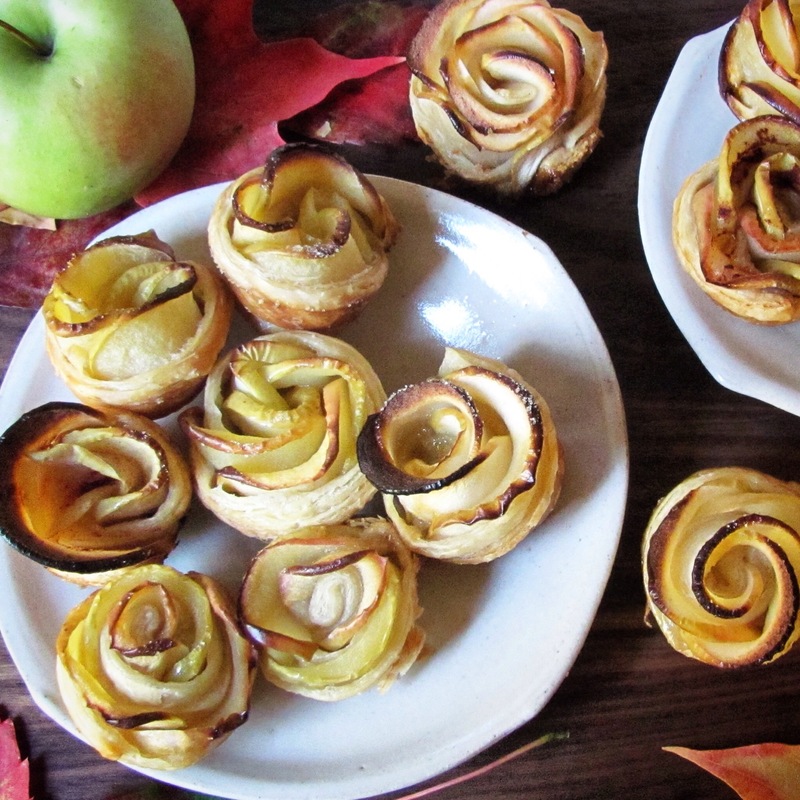 Repeat this process twice more with the remaining apples and dough. When you’re finished, make sure the last batch gets to stay in the freezer for at least 15 minutes. 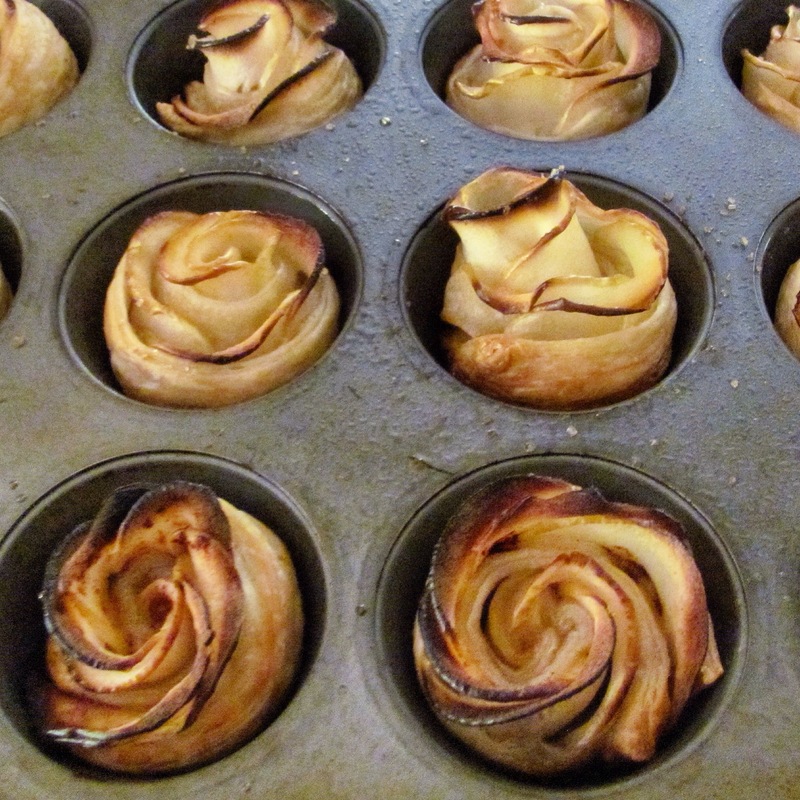 Before they go into the oven, sprinkle the roses and/or buds with some extra sugar. Bake 35 minutes for buds and 45 minutes for roses. They are done when the pastry is GBD (golden brown and delicious). If you open the oven to peek every few minutes, they will take longer to bake. Let them cool for 5 minutes, and then remove them to a cooling rack. If they stick, use a paring knife carefully to loosen them from the muffin cups. Serve. If you have any leftover, they will keep well at room temperature overnight. Special thanks to Michael Laico for the beautiful walnut board! Final note: My beloved brother died of lymphoma in 1987. Since his death, enormous progress has been made in the treatment of blood cancers like the one that took his life. Martin is alive today and his prognosis is excellent because of cancer research. Please consider making a donation to The Leukemia and Lymphoma Society. Thank you! 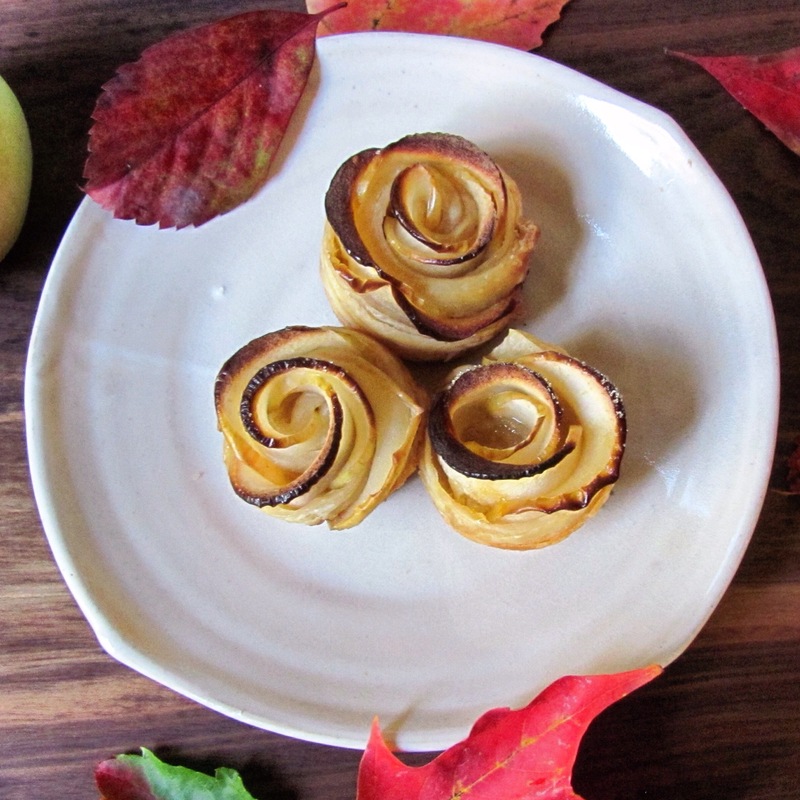 This entry was posted in baked, baked goods, dessert, treat and tagged apple roses, apples, cancer, donate, gift, leukemia, lymphoma, pastry, puff pastry, roses, special occasion, vegetarian. Bookmark the permalink. Well, thank you so much for trying! I’ll have my tech angel look into it! I finally looked at this. 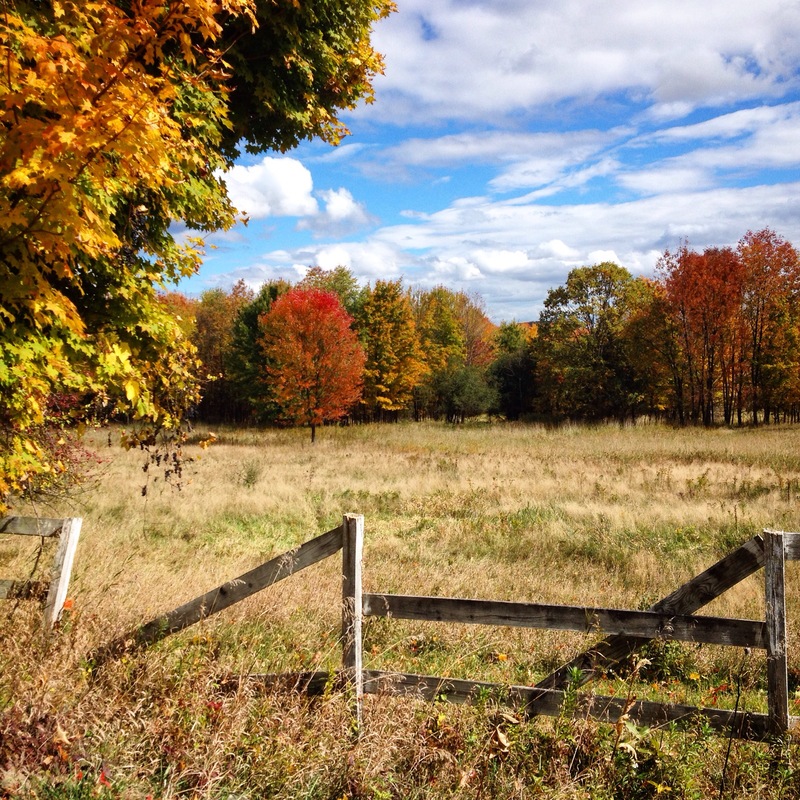 I was able to pin one of your photos. I think it might have been a user error. Ha ha, I bet they would! What is it about the creative process be it baking, or in my case jewelry making that is so therapeutic? When I read this timely post I was struck by this coincidence. Like you, I have lost a very, very dear loved one; a close friend of 26 years to AML, a particularly brutal and lethal form of leukemia, that is in essence a fatal diagnosis. 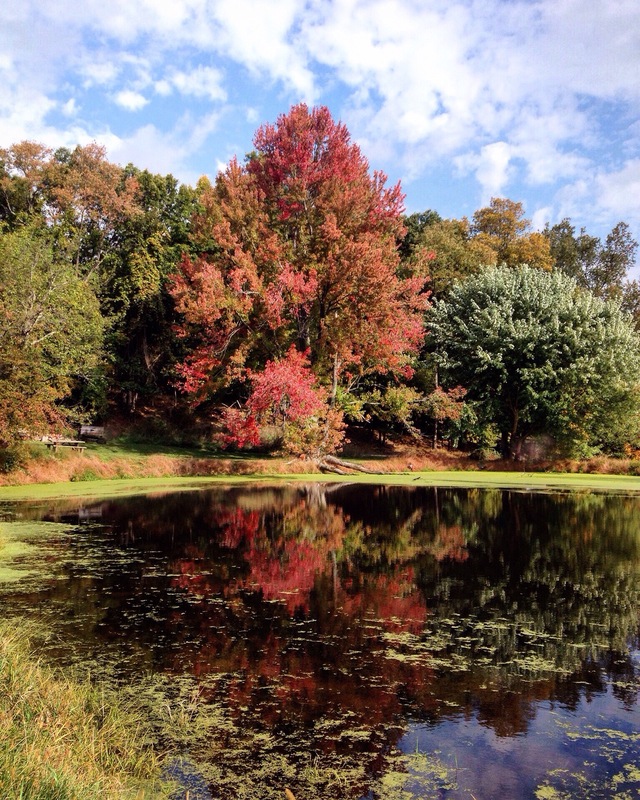 I attended the funeral yesterday am, only to read your recipe this am and the story behind it. In my intense sorrow, I was driven to create a symbol of my affection for her in the form of a rose accented pendant, which I fashioned into a necklace that I duplicated for all her close friends to have and wear in her memory. I, too have donated annually to the leukemia and lymphoma society which began after her diagnosis 5 years ago when another of her close friends started a campaign to fund his marathon run for the society. Tragically, this year it will be a donation honoring her memory, but she put up an amazing fight after 2 bone marrow transplants and many many months in the hospital, living most of the last year of her life confined to her home. All the while, she never complained and instead took the opportunity to cultivate deeper relationships with her friends and family and immersed herself in their daily conversations and concerns. Somehow the rose seems an apt symbol both for the fragility of life but also its unfolding beauty and potential to find that loveliness in the worst of situations; even a dried rose is treasured, as do our loved ones that we are compelled to preserve in our memory. When I bake this beautiful and undoubtedly delicious recipe, I will have yet another apt reminder of the need to embrace every day like the miracle it is, never making the mistake to take life for granted as it is truly a gift. Can you freeze them for a few weeks before baking? I’d love to make these for tomorrow, Easter Sunday! 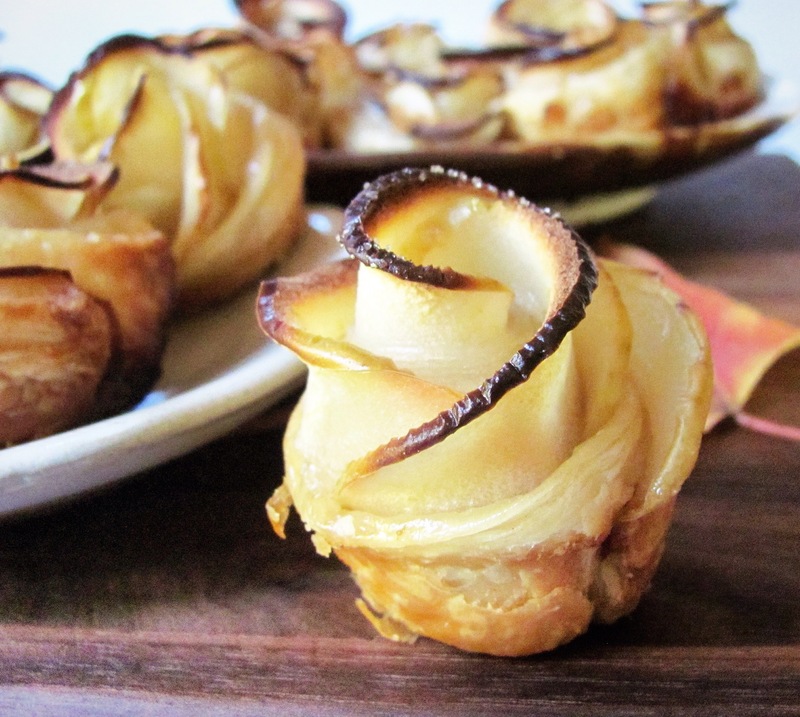 My sample roses are in the oven as we speak, but if they turn out great, I’ll make 6 more. My question is, can I prepare them in the silicone cupcake forms and freeze or refrigerate til tomorrow? I’m hoping to free up some time for other food prep tomorrow.